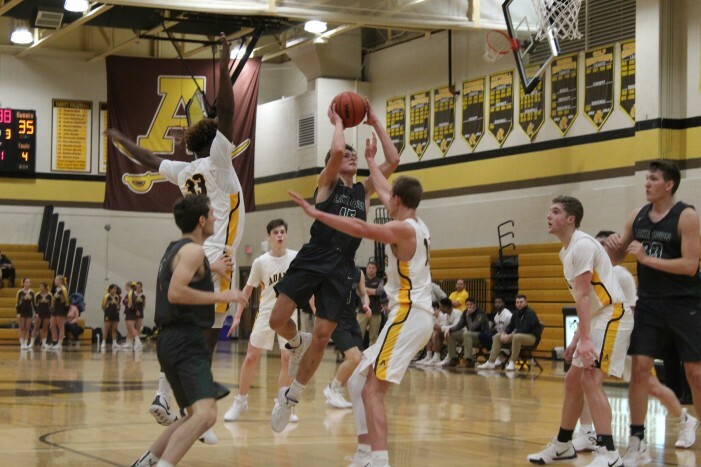 In their first game of the season, Lake Orion’s varsity boys basketball team traveled to Avondale High School to take on the Yellow Jackets. 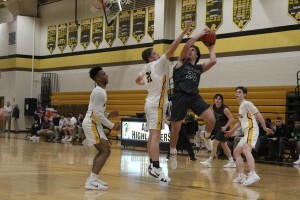 Lake Orion was able to put the game away by outscoring Avondale in three of the four quarters and finished the game with a score of 71 – 44 to take home the victory. Junior Drew Van Heck goes up for a shot on the net surrounded by Highlanders. The team was lead by senior Nathan Talbot with 21 points; senior Jacob Rydquist and junior Drew Van Heck each contributed 11 points. Seniors Shane Barkley, Kyle Loken, Rydquist and junior Mitch Howell played tough defense, allowing the Dragons plenty of breakaway opportunities. “We are definitely playing a more up tempo game. We’re trying to push the ball a little bit more and run and hopefully wear people down in the second half. I think that definitely happened in game one, because Avondale was a very young team and they weren’t as experienced as we were. I think we played more people, some of their kids got tired but that’s the goal is to try and wear people down and to get into their bench and we hope that our bench is better than the other teams bench,” said Head Coach Jim Manzo. On Nov. 20, the boys headed down the road to nearby Adams High School to take on the Highlanders. After getting into foul trouble early in the game, the Dragons were able to get control of the floor and take home another win with a score of 51 – 41. Talbot again lead the Dragons in scoring with 14 points, followed by juniors Isiah Harris with 10 points, and Jack Cummins with 9 points. Because the team has moved up two divisions since last season (from OAA Blue to OAA Red), Lake Orion will play the two-time defending state champions and their school rival, Clarkston, twice this season. 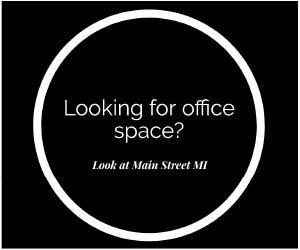 “I think Clarkston’s still going to be the top dog until somebody beats them. I know they’ve lost a lot of kids to graduation, they have a new coach so there’s a lot of variables there, but until somebody beats them I still consider them one of the top competitors,” said Manzo. The boys are now 2-0 on the season. Lake Orion held their home season opener against Troy Athens on Tuesday after The Review went to press. They will take on Lapeer on Friday in the LOHS Field House.